Life Candy: he's wrapped around her finger. he's wrapped around her finger. 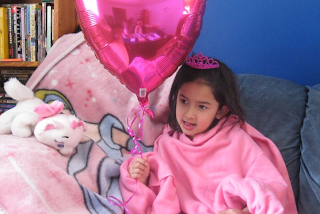 Mini: "Mommy, may I please, please, PLEASE have a pretty pink balloon and a pink Snuggie?" Answer: "No, I don't think so, sweetie. Maybe next time." Mini: "Daddy, may I please, please, PLEASE have a pretty pink balloon and a pink Snuggie?" Momma, can I have some candy? I leave for the gym and come home to chocolate-face-covered children. aw crap, is this what i have to look forward to?!? Hahaha! It is a father's duty to give in to his daughters and make the mother look like a total meanie! She's established precedent now. You're toast. Also? I heart Mini. very cute! her relationship to men is forever cast from early experiences like these. hmmm... i'm guilty of the same with my sweetheart. awwwww see I'm the one buying up the stores for the boys, hubbie is the one saying "no maybe next time" to MY precious boys!!! Has Daddy ever been able to say "no" to a pretty girl asking for something shiny and cute? "Honey, I really really really would like a new Asus laptop...."
Well, yeah, how can you say no to a kid that cute? Okay, that is hilarious! I love it! In our house it's the total opposite--Leo always is the "no" person. Me? Huge sucker for the girls, haha!